The White House Ornament Collection presents The 2003 Mount Vernon Anniversary Ornament. 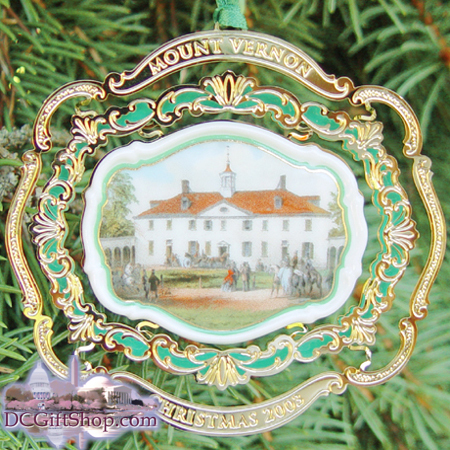 The 2003 Mount Vernon ornament celebrates the 150th anniversary of the founding of the Mount Vernon Ladies� Association. The design of the ornament is based on one of a trio of lithographs printed by New York publisher N.S. Bennett and Company in 1859. Copies of all three prints were sold to help raise funding to purchase the Mount Vernon estate. Proceeds from the sale of this ornament will support on-going preservation and education initiatives.